In the previous article on the Conversation Ecosystem, I introduced a hierarchy of increasingly valuable conversations. Some great feedback from you inspired a better visualization. In The Conversation Ecosystem, I presented a perspective on the conversations around you, your company, and your product. The conversation ecosystem is building on ideas introduced in The Conversation Economy, which build on several great ideas from some great thinkers. 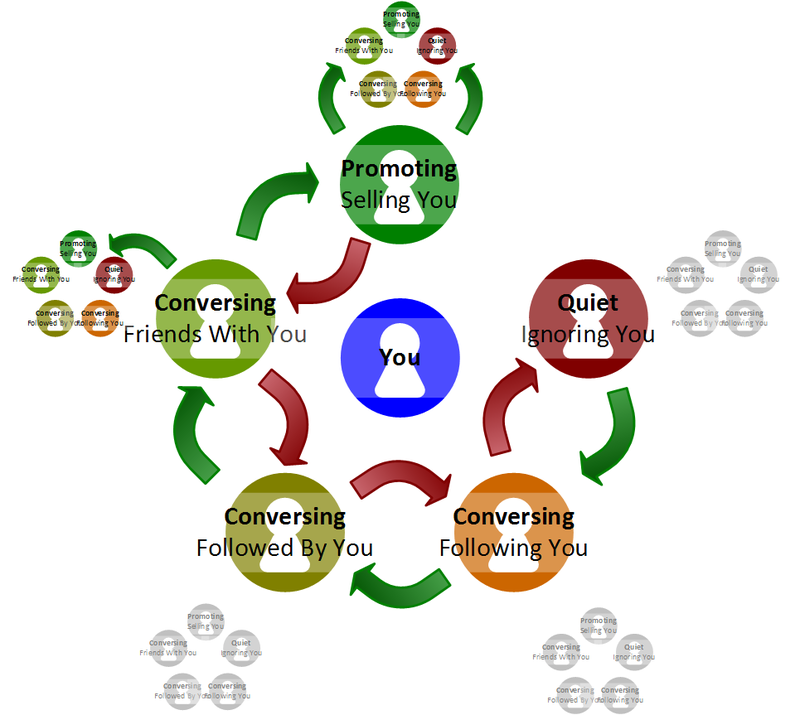 That presentation of the conversation showed a hierarchy representing conversations of increasing value to you. For example, following someone is more valuable (to you) than being followed by them – because it gives you an opportunity to gain market insights. Being friends with that person is significantly more valuable than that – because it gives you permission to explore your market, try new ideas, fail quickly (with reduced penalties for failures), and discover and validate important trends, problems, and ideas. Each of the elements above was presented separately, but the above view is what it added up to. April Dunford pointed out that you don’t always move from one level in the hierarchy to the next (up or down). An ecosystem is the environment around you. Combining the two ideas led to an improved visualization of the conversations around you. Adding all of the possible transitions within (and entry points into) the conversation circle would just make the diagram a mess. Viewing the conversations as a circle around you instead of in a stack helps expose another key element of conversation, and why managing it can help you grow your conversations. Conversations lead to introductions, which can then lead to new conversations. When you are conversing with a friend, that friend may introduce you to some of the people he is having conversations with. 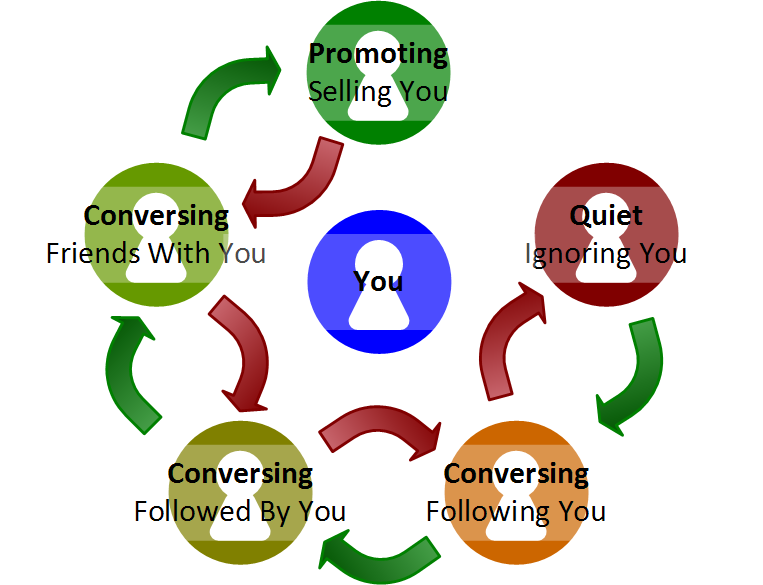 When you are conversing with someone who is promoting you, she is explicitly making other people aware of you, and encouraging them to have conversations with you. You’re even more likely to have conversations with them. Someone who is followed by you is conversing with their friends, and you can see some of those conversations – but it is analogous to eavesdropping at a party. You won’t get introductions to those people. This is still a valid avenue to growing the size of your conversational circle, but you’re starting the conversation by saying “I overheard you talking to Jimmy, and you mentioned you were a horticulturist – that must be fascinating…” Awkward. Conversation, certainly in the conversation economy, is built on trust. You won’t engender much trust by saying “Hey – I was stalking this friend of yours, and by going through her trash, I found your phone number.” That’s why you don’t get access to that circle of people. I’d love your feedback on this view of conversations. What ideas come to mind when you look at things this way? Thanks for this post, defining the levels of engagement is definately interesting. I’m not sure about your statement that following a customer is more valuable than being followed by one. You can get market insights by conversations with customers, but only if it is somewhat related to your product. I can’t read all tweets of the people following the products account. It would be way too much and off topic. But the direct messages, reply-twets and @-mentions are interesting. Holger, thanks for the comment and welcome to Tyner Blain! Customers that follow you give you an opportunity to send a message. Customers you follow are saying things you might be interested in. As you point out, having a dialog is more valuable than either – these are your “friends” in my model. I considered reversing the order of followed versus following, because it is easier to realize the value of followers as you implied. But I contend that the higher value is in listening to your customers, not broadcasting messages to them. So I placed it “higher” even if the value is currently difficult to unlock.